This is a commission that I completed yesterday for a lovely client that wanted a rendition of herself atop her spirit bird (the red-tailed hawk) flying into the sky. I used the beautiful colors of the red-tailed hawk for inspiration, and I guess that nature truly is the best teacher! 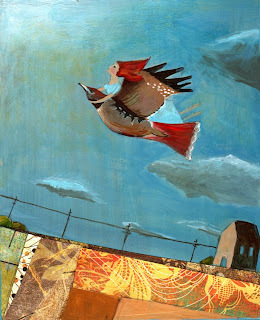 I love this color combination and may need to draw on that bird's plumage again for another painting! 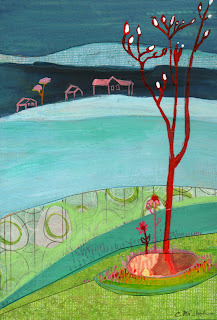 This is a new painting I completed yesterday -- and the first inspired by the view outside the window of our new house! I sketched this one while looking outside the upstairs window, then kind of changed the colors and season & feeling to reflect a more springy mood. I am so tired of seeing gray skies and storms, even though the cloud formations are gorgeous. This original 5x7 painting will be available on my website later today, and the print is coming soon to ETSY. Good morning! I've decided to introduce something a little fun to my ETSY site, and that is a Monday $15 print sale. Every Monday from 8 a.m. - 5 p.m. I will feature one print for $15. I will also try to preview the print on Sundays here on the blog. 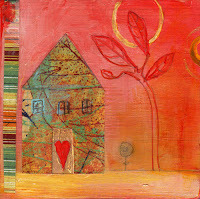 :-) I hope this allows those on a tight budget to purchase a little bit of art! 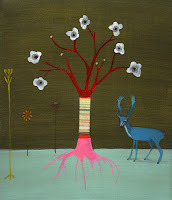 "Home at Last" 7x7 inch print on velvet fine art paper. If the print is sold out when you try to purchase it on Monday, convo me on ETSY or e-mail me at cnichols19@aim.com, and I will load another. As long as I receive your e-mail by 5 PM Eastern Standard Time, I will honor the price. I know it's cheesy to blog about such things, but who doesn't sneak a peek at US magazine once in awhile? So, please forgive me. I can't help myself. Last week Susan Sarandon purchased two of my prints, and I am just tickled. It's funny because we read so much about famous actors and actresses, but we hardly ever get a chance to see what kind of artwork they might be drawn to. Can you guess which celebrity purchased which artwork? 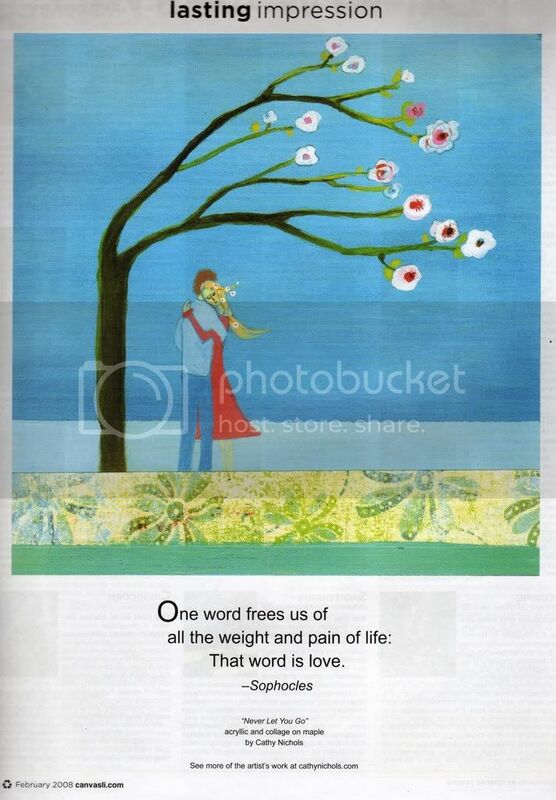 Susan Sarandon purchased the two prints "Okay to be Different" and "Room for Everyone." 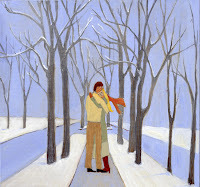 Julia Roberts purchased the original painting, "February." And Owen Wilson is the proud owner of "Adagio." I didn't get to meet Susan or Julia, but I was there when Owen Wilson started pulling "Adagio" off the wall at the Ten Women Gallery holiday party. I was outside chatting with my friends when I went in and asked, blushing beet red, "Can I help you with anything?" and he said "I'd like to buy this one." Of course, I was more than happy to bring it up to the cash register -- and my mom ran up to him and said "Oh, that's my daughter's painting!" I'm surprised she didn't ask for his phone number. : ) He was really cute in person, and quite a romantic, it seems. Of, course, I think that everyone who purchases my artwork is a STAR! And I thank you all for being so supportive and for helping me to keep doing what I love. Have a beautiful weekend (it's snowing here in New York). Trying to look 'joyous' after traveling to Woodstock in a 4 hour snowstorm! 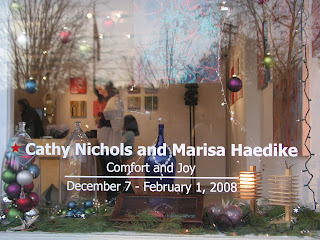 Oh, how I loved seeing our names etched onto the gallery window! Marisa Haedike and I have been lucky enough to exhibit our work together since 2005! First at the Ten Women gallery in Venice, CA, then again Christmas of 2006 in LA for the gloriously fun "darklings" show and, finally, this past fall at the Enormous Tiny Art Show ii at wonderful Nahcotta. Yet I will always treasure the above photo because it is just the two of us, and Marisa is such a dear friend and inspiring artist. PS - while the sign says the show ends Feb. 1, it has actually been extended through the end of February. So visit if you are in the neighborhood! Happy Valentine's Day! It's Good to be Back!! After a long hiatus, I'm finally back! 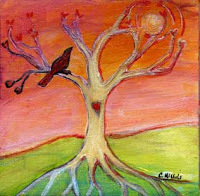 I thought that Valentine's Day would be a fitting date for my return since the theme of love is so central to my work. Plus, I just love hearts. Pictured above are the valentines I am giving my family. 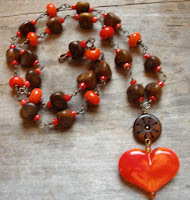 They are all getting heart suncatchers from the marvelous Argentine artist diasyflores on ETSY. I got myself a little trinket, too, this beautiful necklace from ETSY artist Lorelei. And, of course, I've been busy creating special (and specially priced!) 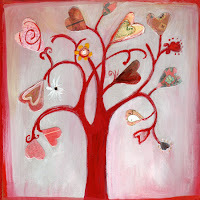 paintings for Valentine's Day. The above works are all available on my website and at the Ten Women Venice gallery in California. 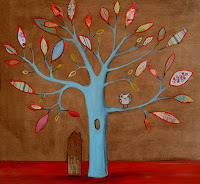 "Sweetheart Tree" mixed media on wood $100. 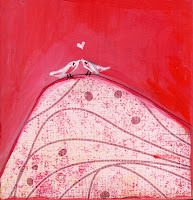 "Lovebirds" 5x7 mixed media painting on wood $125. "Just You and Me" mini painting $45. 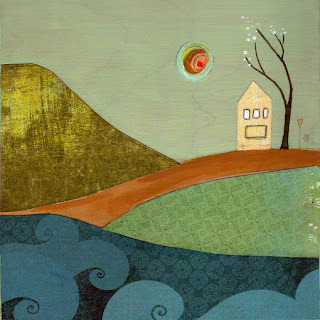 "Home by the Sea" 8x8 mixed media on wood (original SOLD). Fulfilling a lifelong dream of mine, our family has moved to an adorable 1920s cottage by the water in Long Island. It is so cute, and I can't tell you how nice it is to wake up to the sound of birds rather than car horns, sirens and jackhammers of Manhattan. I feel truly blessed. I will post pictures after we do a bit more decorating. 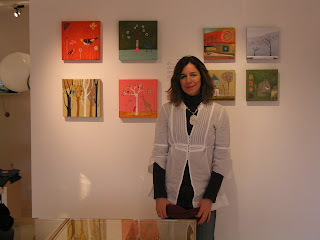 You will see my paintings featured prominently (of course!). And, by the way, our new house is in Centerport, NY -- the very town where I spent my wild youth. And I am now officially engaged! My lovely boyfriend proposed at a restaurant in Paris called "Venice ....(something French)". It was very appropriate because that was where we spent our first romantic Valentine's Day 2 years ago when he came to visit me in Venice, California! Yay! "Never Let You Go" 8x8 inch mixed media painting on wood. Original available on my website. The wonderful Long Island magazine, Canvas, has featured my work on their "Lasting Impressions" page for the February issue. 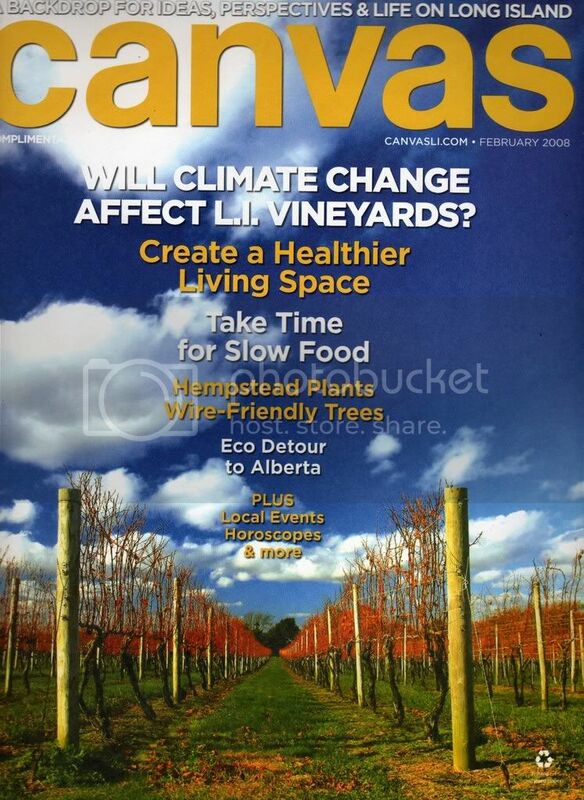 Canvas covers art, lifestyles and holistic, green living on Long Island. You can also find prints of "Never Let You Go" on my ETSY site.